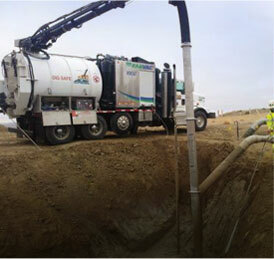 Hydro excavation uses pressurized water and air to excavate soil. Hydro excavating needs less labor, less restoration, less backfill, and has less environmental impact than conventional digging methods. This method uses a tube to convey the soil/water slurry to a truck-mounted debris tank and is non-mechanical.